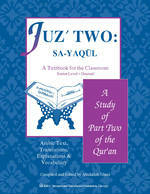 This workbook is a companion to the senior-level textbook, Juz' Two: Sa-Yaqul, especially prepared for classroom and home-schooling. Workbooks are integral part of IQRA's comprehensive program of Islamic Studies and must be used along with the textbooks. This workbook contains engaging exercises dealing with comprehension, critical thinking skills and mastery of new vocabulary words. Each section ends with some Hadith related to the theme of the Ayahs under study. The section Hadith Connection is developed to integrate the teachings of the Qur'an with the Hadiths of Rasulullah (S). This is a unique effort in integration of various subjects in one lesson!